Indulge in some much needed girl time while painting pottery during Ladies Night! Ladies… Imagine a relaxing night creating your own work of art while gabbing with girlfriends. Come join us on the last Thursday of the month from 6-9pm at All Fired Up as we close down the studio to the public for our Ladies Night Out! 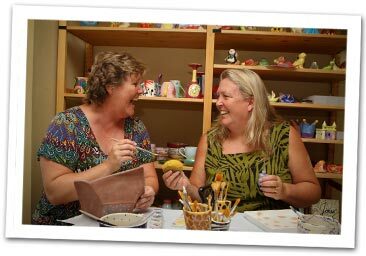 Enjoy a relaxing atmosphere, free snacks, AND receive 10% off pottery and glass fusing projects! The party is just getting started! Reservations are recommended. Or check out our calendar for the next ladies night!